This section contains information regarding the order in which the Joint Commissions Data Warehouse evaluate submitted files, which contain aggregate population and sampling counts. Transmission of population and sampling counts are used to assist in evaluating completeness of submission in accordance with The Joint Commission's sampling requirements. Each case that is rejected by the process will be listed on a report along with a brief description of the problem. Vendors will access the Joint Commission's HCD Reports via the Performance Measurement System Extranet Track (PET). If appropriate, files are verified to be proper zip and XML files. If the files are invalid, reject the file(s) and stop processing. If the files are valid, continue processing. Data are evaluated to ensure that three individual time periods, which make up a calendar quarter, exist within the file. If the data are not expected, reject the XML file and stop processing. If the data are expected, continue processing. The Measure Set /Stratum is evaluated to ensure a valid value is submitted. Data are evaluated to ensure the quarter for Time Periods is open for data submission. If the Data Collection quarter is closed, reject the XML file and stop processing. If the Data Collection quarter is open, continue processing. If the files are submitted to The Joint Commission: The Health Care Organization Identifier is evaluated to ensure a valid value is submitted. If the files are submitted to The Joint Commission: Data are evaluated to ensure the Measure Set(s) or Strata are expected from the submitter. If the data are not expected, set the reject 'Pending Database' flag = Yes, continue processing. If the data are expected, set the reject 'Pending Database' flag = No, continue processing. If action-code equals Add, continue with processing. If the action-code is missing or invalid, reject the XML file and stop processing.. 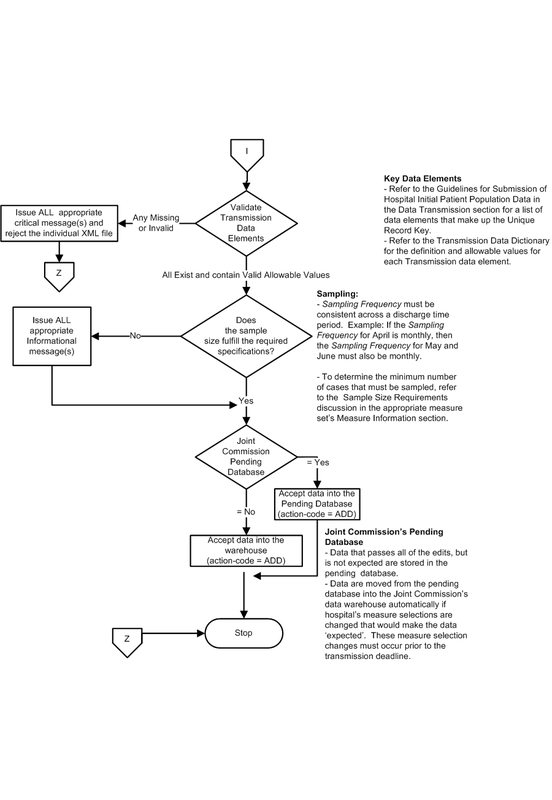 The transmission data elements, as defined in the Transmission Alphabetical Data Dictionary, are evaluated to ensure they exist and contain valid allowable values. These transmission data elements are required for all submitted files. If any transmission data elements fall outside of the data integrity checks, reject the XML file and stop processing. If any transmission data element is missing or invalid, reject the XML file and stop processing. If all transmission data elements exist and contain valid allowable values, continue processing. Data are evaluated to ensure that the sample size fulfills the required specifications. Sample Frequency must be consistent across all three time periods within a calendar quarter. If the data are not expected, informational messages generated, continue processing. 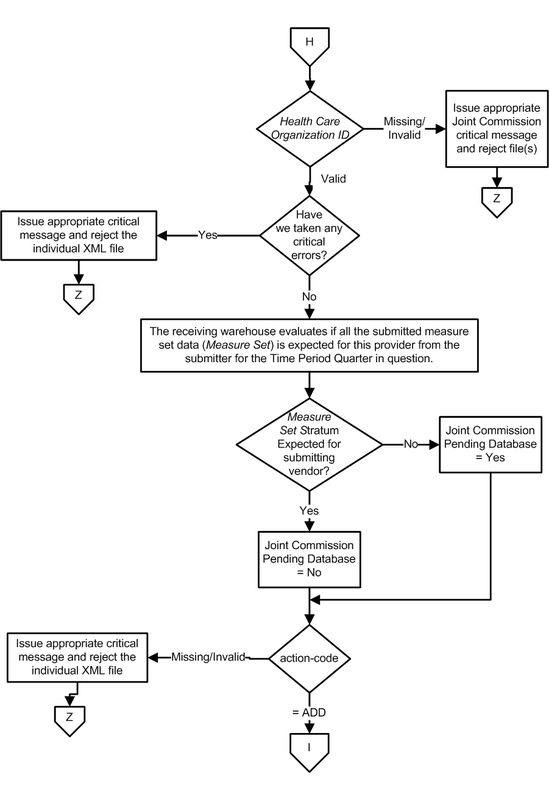 If the Pending Database flag = No, the case is accepted into the Joint Commission's Data Warehouse. 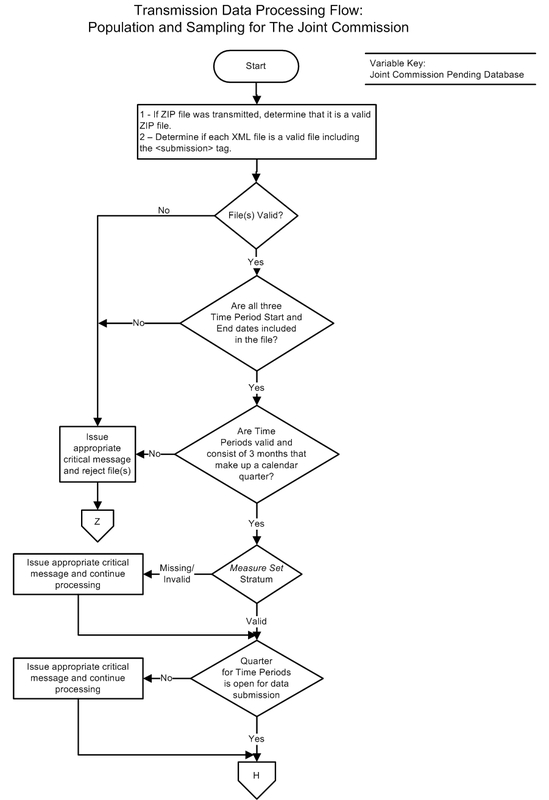 If the Pending Database flag = Yes, the case is accepted into the Joint Commission's Data Warehouse automatically if hospital's measure selections are changed that would make the data 'expected' (refer to step #6b above). These measure selection changes must occur prior to the transmission deadline.